The History Channel’s episode “Iceland” in its “How the Earth Was Made” series, aired Tuesday April 28, offers a companion piece to “Yellowstone” (previous review) with a similar message. The "History" link is here. The progressive little country occupies a land mass, straddling the Arctic Circle, halfway from North America to Europe, and straddling the Mid-Atlantic Ridge. This is the one place where the Ridge rises above water, and the biggest reason is a 400-mile-deep molten well under the surface, much as with Yellowstone. The island experiences fissure eruptions, one as long as 16 miles. The island is growing and separating along the ridge, leading to a depression across the country that looks a bit like the San Andreas Fault in California. The program covered past eruptions, including one in the 18th Century that put a red mist into the air, which consisted partly of sulfuric acid, that drifted over Europe and caused frigid winters and may have created the political unrest that led to the French Revolution. Glacial floods are a major threat in Iceland, such as one in 1996 (try this photo gallery). BBC has a newer article (2002) about more recent fears. But the melting of glaciers as a result of global warming could make a huge explosive eruption more likely. Iceland has the potential for a supervolcano eruption just as does Yellowstone, although there may not be any evidence that one is overdue. History Channel’s episode “Yellowstone” of “How the Earth Was Made” presents one of the most geologically active places on Earth, 8000 feet in elevation, on a mountain plateau nestled in the Rockies, behind the Continental Divide. It has the world’s greatest concentration of hot water springs, mudholes and geyers (“Old Faithful”). The link for the show is here. It is the geology that is unusual and dangerous. A geologist examines the activity underneath Yellowstone Lake, and shows that the gasses have the same composition as that from a volcano – which will turn out to be a supervolcano, so massive that the caldera is not easily seen at one location. Clues were first found about 60 miles away, in obsidian and other layers in rock cliffs. More investigation shows ash from a “supervolcano” eruption 640000 years ago all over the west. There is a colossal volcanic pipe, going down to a depth of 400 miles into the earth (more than 10% the distance to the center) that feeds the large magma chamber, which is itself about 1800 square miles. This sounds like something out of Jules Verne (“Journey to the Center of the Earth”) or even “Core”. Investigation shows that there have been other supereruptions all the way to the Snake River Plane in Idaho. The earthquakes in this region trace out a V-shape, surrounding the huge pipe below. The movement of the North American Plate puts new land over the volcanic pipe. The eruptions (and possibly super-eruptions up to 8000 times the energy of St. Helens) occur every 600000 years at intervals of about 100 miles. The warning signs would be an increase in earthquakes. There are typically 12 small quakes a day. But in early 2009 the quakes increased by a factor of four. 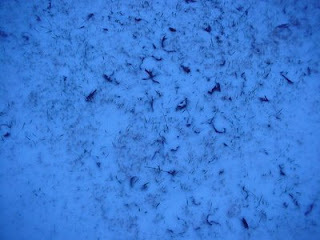 Furthermore the ground is rising right now in 2009. The waters in Yellowstone Lake have lifted a sunken wrecked boat showing that the land underneath the lake is rising because of the expansion of the magma chamber. The largest uplift is near the lake at about 3 inches a year. There are other hot spots, like around Hawaii, but Yellowstone is the only one in the middle of a continent. The film simulates a super-eruption. It could happen tomorrow. Could it have been predicted by the Maya with the 2012 date for an apocalypse? Or will it even be a super-eruption this time? In 2005 the Discovery Channel broadcast the film "Supervolcano" (2005, BBC/Discovery Channel, dir. Tony Mitchell, with Tom Brokaw), with a fictitious massive eruption. I visited Yellowstone in May, 1981. 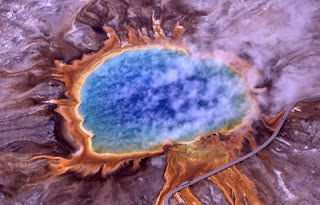 The picture here of “Grand Prismatic Spring” was taken by the National Park Service and is in public domain, on Wikipedia. The Wikimedia attribution page is this. The History Channel has continued its “Life After People” which it introduced in early 2008 as a cable film with a series, which opened tonight, April 21. The best link may be this. The first episode is called "The Bodies Left Behind" and will be repeated a couple times. The series opens by examining what might happen to mummies and to embryos that had been frozen. The suggestion is that maybe many could prepare some survivors to be re-awakened after a millennium or so of cryogenic freezing. What would they find? Well, not much. Parrots would actually speak some of our words, but lose them after a few generations as words have no value to their reproduction. One of the most interesting sections showed an island city off the coast of Japan, Hashima http://en.wikipedia.org/wiki/Hashima_Island or Battleship Island, which had been built in the 50s as a compact city around a coal mine. But when the Japanese economy turned to oil (not such a good idea in these days of peak oil and concern over renewables) the island was shut down and evacuated. In thirty five years the island has decayed into utter ruin and looks like a war zone. The segment showed skyscrapers in Houston and Boston collapsing, as well as the implosion of the Houston Astrodome, which has become a bat cave. I think a good sci-fi scenario would be, what could make this happen? A gamma ray burst maybe? Hostile aliens from UFOs (maybe they give us a specific “deadline”)? Maybe the Earth will stand still. History Channel:How the Earth Was Made: Tsunamis; the threat of Cumbre Vieja to US East Coast! On April 7, The History Channel broadcast a major episode of its “How the Earth Was Made,” specifically, “Tsunami”, and, yes, this is equivalent to another “mega-disasters” episode. The link is here. The early part of the program showed the research linking a tsunami in Japan and Hawaii in 1960 to a devastating earthquake off the coast of Chile. Later, the work of geologist Atwater along the Pacific Northwest coast, examining “notches” and layers of sand, show past tsunamis associated with regular earthquakes along the Cascadia fault. Atwater does research to show that a tsunami occurred along the Washington Coast in January 1700 at the same time one hit Japan. The program reviewed the 2004 Indian Ocean tsunami which killed over 250000 people and showed that some areas of Indonesia have regular complex cycles of tsunamis. The most dangerous tsunamis might come from landslides rather than directly from undersea earthquakes. In 1958, there was a tsunami that reached over 1000 feet in an inlet in southern Alaska, at Lituya Bay. Here is a USC reference on the event. The most frightening possibility would be a mega-tsunami on the East Coast, from Newfoundland down to Brazil, from the collapse of the volcanic ridges of the Isla de la Palma in the Canary Islands, with resulting massive landslide, causing perhaps one sixth of the island to disappear. The best known feature is the Cumbre Vieja (with the Caldera de Taburiente), which has long been recognized as having a potential for eruption and collapse; but British geologist Simon Day has found that the entire ridge is much weaker than thought, with many volcanic plugs around the Island providing evidence that the Island is even weaker than thought. A volcanic eruption (which would be 200 times the size of Mt. St. Helens) would result in a huge landslide that would send a tsunami over 100 feet high, perhaps even several hundred feet high, toward the East Coast of the United States in a matter of hours, without much time for evacuations of major cities. There was a minor eruption on Palma in 1949, which left a lot of volcanic evidence of weakness for Day to find, and there is evidence of tsunamis from avalanches going across the Atlantic in the distant past. Is it possible to "prepare" for such a mega-catastrophe? How many refugees from the East Coast would have to be housed by FEMA -- or in people's homes beyond the Appalachians (the Eastern Continental Divide), or at least above the Fall Line. Maybe Roland Emmerich ("2012") will make a "disaster movie" about it. This is too much for the old Parker Brother's game of "Star Reporter" -- or maybe it ends the game. 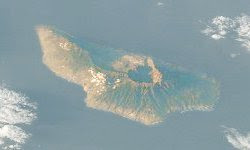 Picture (above): Palma Island, from Wikipedia Commons, NASA photo, in public domain; go to Wikipedia article on “Cumbre Vieja” for attributions. This little island could be the single biggest threat to our way of life! AOL reports that a major tsunami hit the New York harbor about 2000 years ago, possibly the result of an underwater landslide! 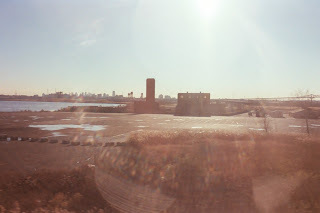 The link (to story "New York's Tsunami") is this. This is very recent and geological times and certainly an alarming report. The History Channel, on March 31, aired “Bible Code II: Apocalypse and Beyond”. The Channel’s own reference is here. There are some other websites that deal with Bible codes, such as “Hebrew Bible Code Matrices” here. I actually could not find a program “Bible Code I” readily. The central concept is ELS, or “equidistant letter spacing” from which dates or events are parsed and accumulated, somewhat as in the recent film “Knowing” from Summit Entertainment. One problem is that it is easy to overinterpret coincidences. 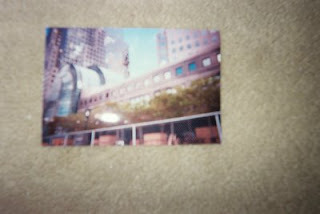 Events in one’s life often seem to depend on coincidences that generate complications that run out of control. But does this mean that the combination of circumstances was really so improbable? There is some attention to the Tomah and locating or dowsing for the original Ark of the Covenant. But then the show returns to the issue of using code matrices to predict catastrophic events. It is shown that the code predicts the assassination of Rabin in 1995. There is a lot of attention to the prediction of 9/11 and all of its targets, including both of the Twin Towers and then the Pentagon. The codes apparently predicted the Malvo sniper attacks in Maryland, DC and Virginia in October 2002. There is discussion of predicting the fall of Saddam Hussein, and an indication that Saddam actually moved the unfound “WMD’s “ through Syria to the Bakka in Lebanon. There is a prediction that civilization will be destroyed by a comet in 2012 (the date of the Mayan end of times), but another prediction that mankind will destroy the comet.